Basic ingredients: Don your dancing trousers and head for the Cotswolds where you’ll find former BBC MasterChef contestant Alexis Thompson who has been running her own cookery school in an airy barn kitchen at her home since September 2010. 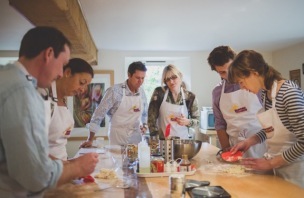 As well as having the most originally named cookery school in the country – “because we all have a pair of dancing trousers lurking at the back of the wardrobe” – courses have snappy titles such as A La Start, Can-do canapes and The Italian Job. New courses this year include Vietnamese Street Food with guest chef Peter Lien (head tutor at the WI Cookery School) and a Japanese Evening hosted by fellow MasterChef finalist Andrew Kojima. Alexis knows a thing or two about food – especially baking – and is keen to share her knowledge in a relaxed and friendly environment. The courses generally run from 9.15am to 3pm and are designed to match your level of expertise from complete beginner to experienced cook. Costs range from £49-£165 per head and classes are never more than eight people. Courses can be tailor-made for small businesses and individuals. They say: We offer straightforward, fun, hands-on courses in beautiful surroundings. We ensure it’s relaxed and sociable – you and your fellow cooks eat the fruits of your labours (all sourced from local suppliers where we can) with a glass of wine and plenty of good conversation. We say: Dancing Trousers’ well conceived list of courses has been honed and perfected over the past five years and the courses are delivered with humour and passion from Alexis and her team. She has developed a real expertise in baking and patisserie and her salted caramel brownies have even been known to convert non-baking students! You’d be hard pushed not to have a fun day out. I attended the Vegetarian a la Carte course in August 2013. This was my first ever cookery course and it completely surpassed my expectations! Alexis put me immediately at ease and I had enormous amounts of fun with lots of “I didn’t know that” moments and lots of useful hints and tips. I held a dinner party two weeks later and cooked EVERYTHING that Alexis had taught me – with great success and lots of accolades! I’ve really got my cooking mojo back and am looking forward to booking my next course. I attended the Macaron Magic course as I wanted to be able to provide macarons in my business. The course was absolutely brilliant, informative and easy to follow instructions from Alexis. I have now gone on to make first-class macarons. Thank you Alexis! I haven’t stopped telling friends and family about Alexis and her Dancing Trousers Cookery School since I went on the Back to baking course. I don’t know how we managed to make so many things in a few hours. Alexis was not only a wonderfully organised teacher but was a really warm, friendly and funny host.She has a real knack for explaining the most complicated recipe in such a clear straight forward manner. I have made many of the recipes at home and my family are so chuffed at my confidence and enthusiasm for baking. I can’t wait to return and try something new. If you are looking for fun environment to learn how to cook something new with someone who will share lots of tips and give you the confidence to try it at home then Alexis and her ‘Dancing trousers’ is the school for you. Dancing Trousers – amazing experience! Alexis keeps her classes small, and the one-to-one tuition teaches you skills that will never leave you. I’ve been on courses before and it is literally a demonstration, but on a visit to Dancing Trousers you are truly the chef. Our day was tailored to our needs, the depth of preparation and professionalism has to all be commended. A really memorable, informative, fun and yummy day out! I had a great day on the ‘Back to Baking’ course at Dancing Trousers Cooker School. Even though I’ve been baking cakes for decades, I still learnt new techniques and my enthusiasm for breadmaking was re-ignited. Alexis conducts the sessions in such an informal and friendly style, giving personal attention, guidance and explanation. She also meets the attendees with such a warm welcome and everyone soon feels relaxed and able to bond with each other. It was a fun day and I came away feeling more confident in the skills learned, plus taking home some lovely goodies! Excellent value for money! I spent a brilliant day at Dancing Trousers on the A La Carte course. It was great fun thanks to Alexis’s warm and engaging style. I learned lots on the course and went away inspired to try out new dishes at home, much to the delight of my family! An absolute gem. My first course was a ‘Back to Baking’ course; I’d been quite an avid baker in the past but work, life etc happened and gradually I baked less and less until lack of confidence acted like opening an oven door too soon on you entry to the local WI cake competition. Alexis’ course restored my confidence in a matter of hours and instilled in me a new enthusiasm. We covered a range of techniques – from scones to bread and the inimitable Victoria Sponge to biscuits. It suddenly seemed quite effortless to produce so much in so short a time and I have undoubtedly also learned to time multiple cakes as a result – my kitchen often seems like a small production conveyor belt! Alexis’ knowledge and enthusiasm to answer all manner of baking questions is impressive and a joy to access. She uses humour and kindness to teach and it was clear to me that I wanted to continue going to her courses. In fact, when I showed friends photos of my efforts from the Cupcake Course, it took some persuasion for them to believe I had produced such decorations and hadn’t merely snapped the contents of the shop window of a local patisserie! I am looking forward to attending the next course as soon as I can! I absolutely loved my morning at Dancing Trousers and never imagined I would learn so much about baking and finishing cupcakes! A fabulous experience delivered by a great team. I had a most enjoyable, informative and encouraging day with Alexis learning how to prepare and cook fish. It was set in beautiful surroundings and we learnt lots of skills and tips. We packed such a lot into the day and enjoyed some lovely food after. I have been lucky enough to have received a voucher for the Dancing Trousers Cookery School for the last two years at Christmas and I can’t praise the place highly enough. From the moment you enter you are made to feel so welcome by Alexis and her assistant Wanda. The surroundings are truly beautiful, the atmosphere is relaxed but very professional and the day is also full of fun. I have learnt so much on both courses and Alexis is a fantastic teacher who always has time to explain things and to demonstrate techniques on a one-to-one basis. A very lovely part of the day is when you all get to sit down together to eat what you have created throughout the day together and have a glass of wine and a chat. Both times I have come away so enthused by Alexis and so very proud of the new skills I have learnt and the food created. Wonderful, I would recommend it to anyone! We’ve attended two Dancing Trousers cookery courses as a team. Brilliant fun, amazing facilities and Alexis is an excellent (and fun!) teacher who makes cookery very easy to learn – even quite complicated dishes. 100% support from us! At Dancing Trousers, small really is beautiful – there’s no back-up team of assistants, no big promotional machinery, just bags of expert, one-to-one tuition from Alexis, lots of fun and some great results. I’ve been on two courses at Dancing Trousers, the A la Carte and the Macarons, and both were innovative, clever and fun. And the real test? I really can (and do) use the techniques and recipes I’ve learnt, at home. My friend and I had a fantastic day at Dancing Trousers on the A La Carte cookery course. We had great fun, learnt new skills and had a fantastic meal afterwards, cooked by us. We felt like we’d got to know the other people on the course and it was all very relaxed. Alexis is fun and extremely patient, she makes the daunting thought of cooking something new into an amazing experience to be remembered and talked about for a long time. The surroundings of her school are beautiful and you come away feeling refreshed and energised, almost like a spa day with wine and food! As a reluctant cook, I came away from A la Carte with enthusiasm, knowledge, skill and a sense of achievement – I can’t wait to go back and learn some more: best of all is that the level appeals to both competent cooks and left footer chefs like me! My bread looked like bread and tasted heavenly, the main course (caramelised shallot tart- actually it had a smarter name), was simply delicious and is now part of my repertoire. I hope Dancing Trousers produces a cookbook folder soon. I completed the ‘Just Desserts’ course with a friend. Such a happy day. Wonderfully informal while at the same time hugely informative. Alexis is a great teacher and her kitchen is a lovely place to spend time. Would definitely go back again. I thoroughly enjoyed Alexis Thompson’s course. She is friendly and engaging, her recipes are exciting and her kitchen has a lovely welcoming atmosphere. Her course was a great way for us to share a special afternoon with close friends, learn a variety of useful techniques and be inspired! I have been on a one-day cookery course with Dancing trousers recently and it has inspired me greatly to be more adventurous with my cooking. It was informal and very relaxing and I learnt so much. Alexis made it great fun, so much so that I have booked myself on two more courses and can’t wait to return to learn more. Dancing Trousers captures the passion and professionalism that you would hope to see when booking a cookery course. The experience offers both practical and insightful guidance to kitchen skills and food preparation. It’s also about building confidence, exploring new ideas and having fun at the same time. I can honestly say that the two courses I have done on Fish and A’ la Carte were the most enjoyable, relaxed (and yet well disciplined) experiences I have participated in. I would highly recommend Alexis and Dancing Trousers as a Cookery School that can work on multiple levels depending on your level of experience, from absolute beginner to proficient. Doing a gluten-free cookery course with Dancing Trousers was a great learning experience as well as being a lovely day out. Between us, the group had various food intolerances and so Alexis devised a delicious menu that we enjoyed making and eating, in beautiful surroundings. I have gone on to make everything at home for others to see how tasty it was, and have changed many poor cooking habits too! My husband bought a Dancing Trousers voucher for me for our first wedding anniversary. Now, this could have gone one of two ways – divorce or great praise! Luckily it was the latter, as I had the best morning ever on the Macaron Magic course. Alexis is so talented; she has the most wicked sense of humour and her stunning school is just a pleasure to be in. My macarons were so professional looking and the salted caramel we made for the middle was pure decadent yumminess. I’m a fan for sure; I can’t recommend Dancing Trousers highly enough. I have attended several Dancing Trousers courses but most recently “Back to Baking” which was simply brilliant and I went home with so many lovely baked goodies. Courses are incredibly professionally organised, Alexis is so friendly and guides you effortlessly through her wonderful recipes with lots of encouragement and tips. I have learned so much and regularly cook the recipes from the courses I have attended. My plan is to ultimately do all Dancing Trousers courses. I cannot recommend Alexis and Dancing Trousers highly enough!